These have been used but do work as they should! Do show signs of use as you can see and laces are mismatched. Rock Skates. 2 types of wheel sets mix -matched. Black boot with gray stripe, neon green laces and hook and loop strap. small hole on left boot's inner lining at collar on outer ankle area. Bearings in good condition. Very gently used condition overall. These skates were worn once and are in top condition. Novice or expert, you will experience a great ride! Black soft leatherette boot with turquoise clear pulse outdoor wheels and comfortably lined tongue. These are woman size 9. They are in like new condition. The photos show the condition. 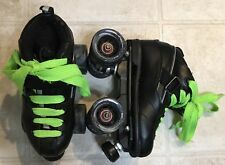 Rock Skates Speed Freaks Flames Wheels Size 8 Men's. Speed freaks wheels and Bionic toe stops. Black with red and yellow flames. Great Condition. Please review all photos, as they are part of my description. Shipping is a flat rate of $ 14.00. Thanks for looking! THE USA MADE ROCK PLATES FEATURE A 10 DEGREE DOUBLE ACTION CUSHION SYSTEM FOR QUICK AND RESPONSIVE TURNS AND ALUMINUM TRUCKS. THESE ARE ASSEMBLED USING MOUNTING BOLTS, NOT RIVETS. THE MOUNT IS DEAD PERFECT AND VERY CLEAN.